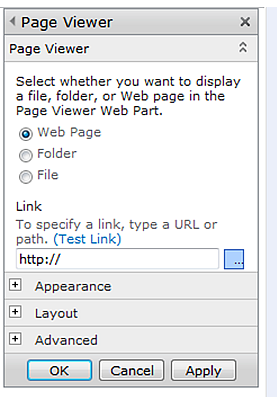 Issue : How to upload a .pptx file in webpart in sharepoint 2010. Use page viewer web part . Upload the PowerPoint document that you would like to display to a SharePoint document library (ideally located on your site). Then view the document in the browser. Once on PowerPoint document view we will follow the first intuition would be to copy the current URL and add it to the page viewer. However, this will display an error message. Ok No issue let it be . We will Open the Developer Tools in Internet Explorer (F12), and search for iframe . Copy the result into your text editor of choice. The magic URL you need is the one within the src attribute. Sometime PowerPointFrame.aspx may be PowerFrame.aspx in src . Please update that to PowerPointFrame.aspx . Create/Go to the page where you are trying to display the PowerPoint document. Then on the page viewer web part edit panel, place the URL previously copied to the “Link” section and change the appearance according to your need .